Den of Geek review - It's Christmas time in Purgatory, which means it's time for kidnapping, tampon angels, and bad decision-making. There were definitely parts of this episode I loved, and parts I was more meh about. I am 100% on board with Doc becoming a vampire, and greatly looking forward to future Bobo shenanigans. Not sure what to make of Vampire Doc -- I guess I thought he'd already gotten his immortality back last week, from putting Bulshar's ring on again, but I find I'm always losing my grasp on the mythology in this show. Very nervous about Robin's prospects, what with him coughing up blood the other week, and now having been force-fed mystery green goo and whatnot by Bulshar. I'm assuming the green goo is how Bulshar makes those killer trees - the first one we saw had a man's face and dripped human blood. I'm guessing that Robin will slowly dendrify over the next couple of episodes and they'll be racing to find a cure. Ten bucks says the new firefighter is another incarnation of Julian. Oh man, Mogur, I hope you're wrong just so that one of the Earps could have a nice thing without sharing sexual partners with an immediate relative. 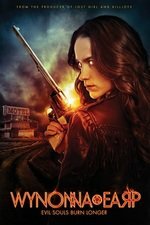 I have seen that speculated around, so I guess people are getting hints that I am not, but I really hope the show is not going to have Wynonna sleeping with her sister's dad & her mom's lost love. It's a little too Flowers in the Attic, right? I did figure Wynonna would get a new friend to mess with her & Doc this season, and I find this Charlie guy hotter than the Black Badge guy who showed up a few episodes ago, so that's cool. Doc on his knees, baring his neck to Kate, was also hot so I'm happy. Check how Julian climbs down the truck at the end of the episode. It's not a hop - he lowers himself like a gymnast, just casually showing off his upper body strength. That was Charlie :) but yeah, I definitely noticed that. Ah, that's my headcanon talking. :) Yes, it was Firefighter Guy, not WaverlyDaddy.